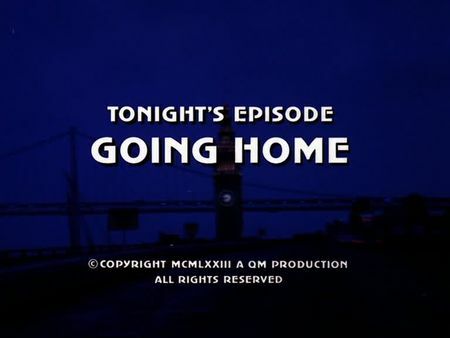 I have just added the screencaps for Going Home to the episodes section. When Eddie Coughlin, a small-time crook, breaks into a corner variety store, he smacks the owner who to his surprise is in the back office, and finds the safe open with two bags of cash money inside. He thinks he finally has his big score until he finds several debentures and "the book" on the mob's numbers operation. On the run from both, the police and the mob's hit-men, Eddie tries to get back with his ex-wife and mother of his five-year old son, however, he soon learns she does not want nothing at all to do with him anymore. With two hit-men of the mob being on his trail, Eddie does not get any help or hideout by his former mates either, so he tries to see his son, Marty, for a last time before going back to the place he ever called 'home' – closed-down federal penitentiary Alcatraz, where he spent several years. However, both, the police and the mobster's hit-men are on his trail. This episode is a real potpourri of San Francisco locations. It starts out downtown where Eddie breaks into Beale’s corner shop at the north-western end of the Financial District. On a funny note, Beale’s shop is supposed to be on Bay Street (it actually is on Battery), and when Mike and Steve are responding to the police radio call, they actually are on Bay Street (we can see Pier 31 at the end of Bay and Embarcadero). Beale meets the mobster boss on a golf-course at Land's End, while Eddie hides out in an apartment close to Montgomery and Pacific Avenue. After seeing his wife in her apartment on Church Street, he tries to find a new hideout in a mate's shabby apartment hotel on 3rd Street just south of market. Mike picks up Steve in front of his partner's apartment on Union Street, and Eddie gets off a Cable Car and uses a telephone booth at Green and Mason Streets. Additional locations include Dolores Park and Alcatraz Island plus some impressive aerial views taken during Mike's and Steve's helicopter flight from downtown to Alcatraz.